The MailPoet Newsletters integration addon allows you to add your affiliates to the MailPoet list when they signup for an affiliate account on your site. First, install the main MailPoet Newsletter plugin (if you don’t have it installed already). Step 1) Create a new list in the MailPoet Newsletters plugin (if you haven’t done so already). Now edit the list you just created and find the unique ID assigned to it. 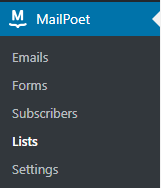 To edit a list you need to go to MailPoet -> Lists and select the “Edit” option under the list. Once you click the “Edit” option you will be able to find the list ID from your browser’s address bar. 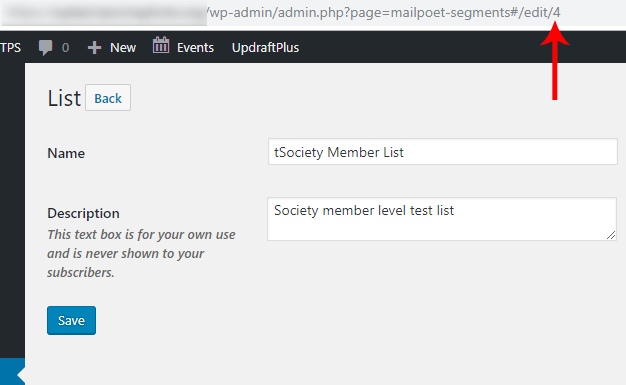 Step 3) Specify the MailPoet list ID (where you want the affiliates to subscribe) in the MailPoet List ID field. Save it and you are done! Now, every time when a new affiliate joins your site, the affiliate will be automatically added to the specified MailPoet list. Please note that some of these free addons are developed by our users in the community. So these addons do not have any advanced customization option. The description above explains exactly what this addon does.